boast some pretty yummy dairy-free goodies provided by local vendors. 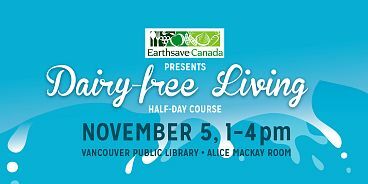 This half-day course will take place at the Vancouver Public Library in the Alice Mackay Room from 1-4pm, and is open to everyone. For more information, please visit the website at www.dairyfreeliving.ca or the Earthsave Canada. Any other questions about the event can be directed to Jen Browne of Fresh + Fit Vancouver at jennifer@freshandfitvancouver.com.